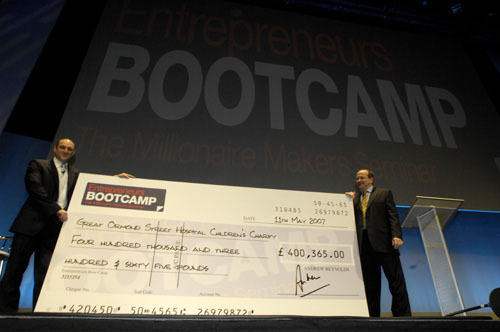 The 2008 Entrepreneurs Bootcamp held at the Brighton Centre last weekend not only attracted a record attendance of over 4,000 delegates but also raised over £468,000.00 for Make-A-Wish Foundation® UK. Award Winning Marketer Andrew Reynolds organised the event and flew in 13 marketing entrepreneurs from Europe, Australia and the USA to give their time, entrepreneurial expertise and training free to all the attendees at the 3 day event. 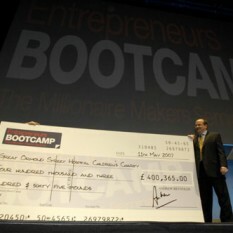 Their generous support further enhanced the fundraising efforts of the Bootcamp event. Make-A-Wish, a national charity has a single purpose to grant magical wishes to children and young people fighting life-threatening illnesses. According to recent research commissioned by Make-A-Wish over 20,000 children in the UK alone are living with life-threatening illnesses. For many families a Make-A-Wish wish can be the last happy memory they have of their child: having fun in a magical world, surrounded by family and friends. To read what some of the attendees to the conference had to say about the event, please read the testimonials.